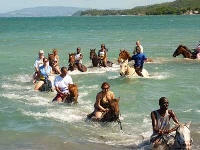 Don’t spend all your vacation days at your all Inclusive Resorts and Cruise cabin, take a walk or a drive out for some great adventures and Excursions the Island of Jamaica Has to offer you..
A stone’s throw from Ocho Rios, one of Jamaica’s fastest growing resort centres, Dunn’s River Falls is unique. 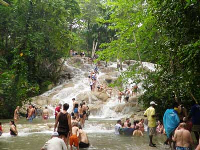 Dunn’s River Falls Park is the perfect environment for fun and relaxation for the entire family. There is a delightful new discovery around every corner. 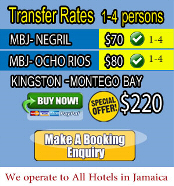 WHITE WATER RAFTING Rafting on the Martha Brae is Jamaica’s premier rafting attraction. A skilled raft captain on a 30-foot. bamboo raft takes visitors on a romantic adventure into the scenic and tranquil beauty of the island. This unique experience encompassing over three miles of beautiful and picturesque river should not be missed by any visitor. Bob Marley Museum is located along Hope Road in the former residence of the Hon. Robert Nesta Marley. The structure has two storeys, the lower being masonry and the upper of timber. The Museum houses memorabilia of the Legendary Reggae Singer and Superstar Bob Marley. Reggae music is identifiable with Jamaica’s culture internationally, and the Museum provides a glimpse into this aspect of our musical culture.